FS1-X is the next evolution in frame synchronization and conversion. 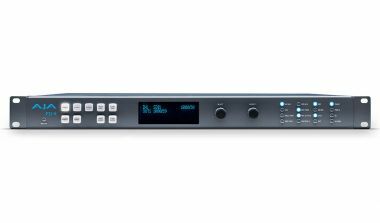 Within its compact 1RU chassis, FS1-X integrates an amazing array of video and audio connectivity and processing, including 64-channel MADI audio over coax or fiber. With its flexible architecture, FS1-X utilizes a high-quality, motion adaptive linear Frame Rate Converter for smooth motion conversion between a wide range of frame rates whether for broadcast, production or live events. Matching up and synchronizing disparate video and audio formats is a critical part of any broadcast, mobile or post-production environment. With the factory-installed motion adaptive Frame Rate Converter (FRC) option, FS1-X creates incredible, high-quality conversions between different frame rate families for virtually unlimited international standards support. The growth of 5.1 and 7.1 audio has increased the number of audio channels that must be managed in a production. The MADI standard provides a convenient way to transport huge numbers of audio channels along a single cable, simplifying the cabling demands for broadcasters, mobile trucks and production. FS1-X supports both fiber and coax 64-channel MADI input and output. An internal 224x224 audio matrix allows full routing of MADI and all audio coming from SDI, fiber, AES and analog sources for an incredible amount of audio processing capability in a single box.